"Djokovic has exhibted better data at Wimbledon 2018, winning 3.4% more points on serve, as well has having a surprisingly large 6.2% edge on return, and his 122.1% combined serve/return points won percentage is markedly better than Nadal's 112.5%, for the event." Rather overshadowed by a certain football match on Wednesday was the men's quarter-finals, which saw the odds-on tournament favourite, Roger Federer, dumped out by Kevin Anderson in a dramatic fifth set. Another player who needed a decider was Rafa Nadal, as he squeezed past Juan Martin Del Potro to land us a winner from our recommended bet, but the after-effects of these arduous wins for Anderson and Nadal may not help them in their quest to reach Sunday's final. A big-serving match tends to have shorter points than one featuring at least one return-orientated player, and so it proved in these - Anderson and Federer played 67 games in 257 minutes (3.84 minutes per game), while it took Nadal and Del Potro 292 minutes to play 55 games (5.31 minutes per game). Quite how much of this was spent by Nadal re-arranging bottles, or procrastinating in advance of points is up for debate, but in all seriousness, this does demonstrate the test on players bodies. These victories certainly cannot be viewed as a positive for subsequent rounds, although it's probably fair to say that if one player can be fresh after a five-hour match, it will be Nadal. 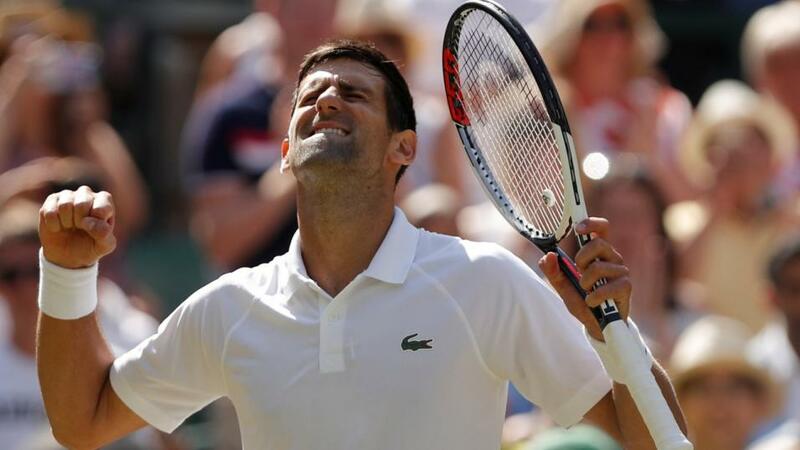 However, I am utterly shocked that the markets are finding it difficult to split Nadal and today's opponent, Novak Djokovic, for the second semi-final, which will commence no earlier than 1500 UK time. Djokovic is available at [2.00] and to me, that's superb value. He played well in the latter two sets of his four-set triumph over Kei Nishikori - a match that lasted 'just' 158 minutes - and created 14 break point chances in 17 return games. In addition, Djokovic has exhibited better data at Wimbledon 2018, winning 3.4% more points on serve, as well has having a surprisingly large 6.2% edge on return, and his 122.1% combined serve/return points won percentage is markedly better than Nadal's 112.5%, for the event. Furthermore, longer-term grass data also is in favour of the Serb - over the last two years, he's won 1.0% more points on serve and 2.4% more points on return, and in the last three, 1.5% more on serve and 1.8% more on return. It is absolutely evident that Djokovic has an edge over his Spanish rival on grass courts over various time-frames, and with the almost five-hour quarter-final for Nadal factored in as well, the available [2.00] looks worth recommending to me. Prior to Djokovic and Nadal, though, the first semi-final takes place, although with such a big-serving nature of the two players, Kevin Anderson and John Isner, it might delay the second semi-final somewhat. Isner got past Milos Raonic in four sets on Wednesday, in a predictably serve-orientated affair, and I expect more of the same against Anderson, who also serves superbly. Both players hold well over 90% of the time on grass, as well as being below-average returners, and tiebreaks are again likely. The market is finding it difficult to split the duo, going [1.97] on Isner to triumph, and I don't think this price on the big American is far from being value. I'd want in excess of [2.06] on Isner, in truth, but I'd much rather favour him at prices than Anderson, who obviously has the already-discussed negative of a long match against the tournament favourite in the last round, as well as losing their last five main tour head to head matches - albeit from a while ago. Isner's grass data over the last two years is also marginally better than Anderson's, so he does look to hold a slight edge in his quest to reach his first ever Grand Slam final.